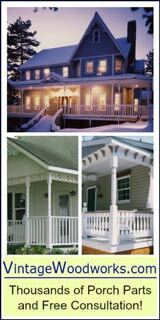 Outdoor Thanksgiving decorations on your front porch, turkey and all the fixings, plus a house full of family and friends - all make this holiday very special. Autumn decorations with harvest colors are perfect for this holiday. 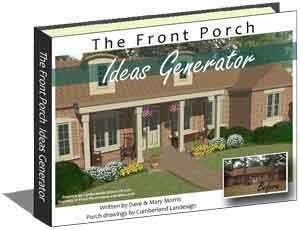 That makes front porch decorating rather easy. Mary and I like extending autumn, our favorite season, for as long as possible. 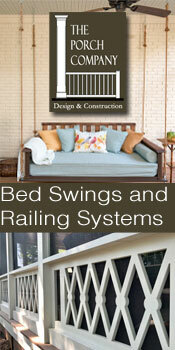 Mary and I have been fortunate to live in many different states and areas of the country. One thing is for sure, we have enjoyed Thanksgiving Day decorations no matter where we have lived. 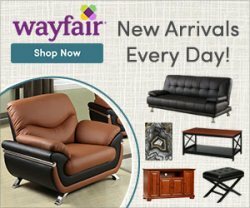 Our photos will give you ideas for beautiful Thanksgiving and autumn decorations. Tis the season for chrysanthemums! 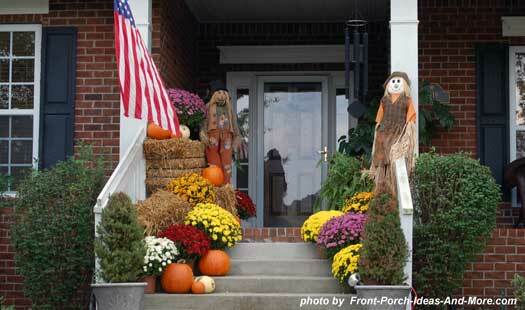 You can't ever go wrong using colorful mums at Thanksgiving to decorate your porch. 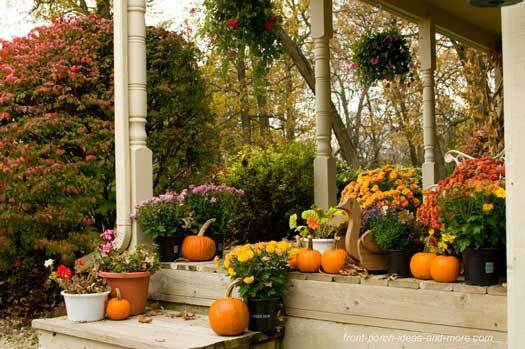 Depending on where you live, integrate other bright flowers as well and a few pumpkins to boot! We always make pumpkin pies for Thanksgiving. After throwing away the tin cans, a thought popped into my head. Why not use the cans as a vase? So I went out to our yard and we still had a few mums in bloom. 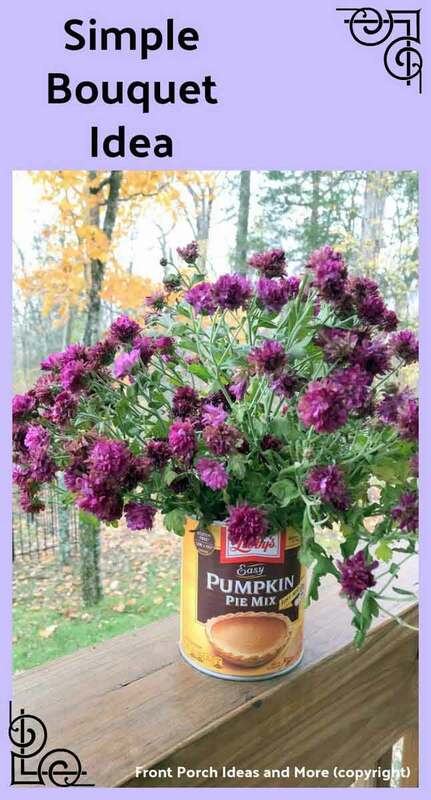 Still having some beautiful color, we picked them, filled the can with water and made this sweet bouquet. For a Thanksgiving decoration, we used a couple of these cuties on our table. And the best part is that this was free. The lesson: don't overlook what you already have. 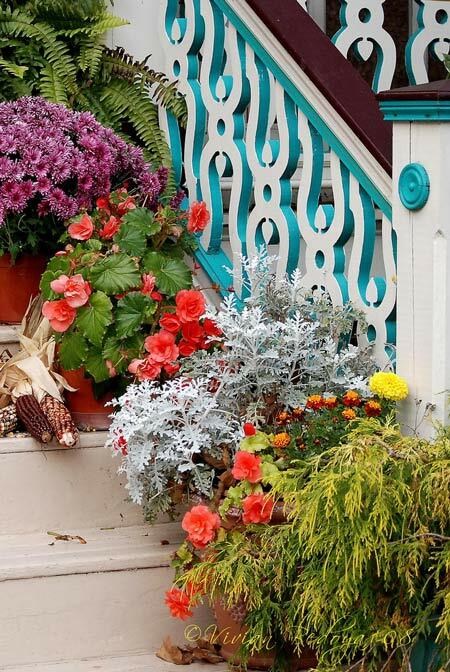 A bounty of gorgeous autumn plants line these porch steps. 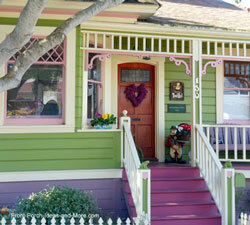 And did you notice the colorful porch railings, too? 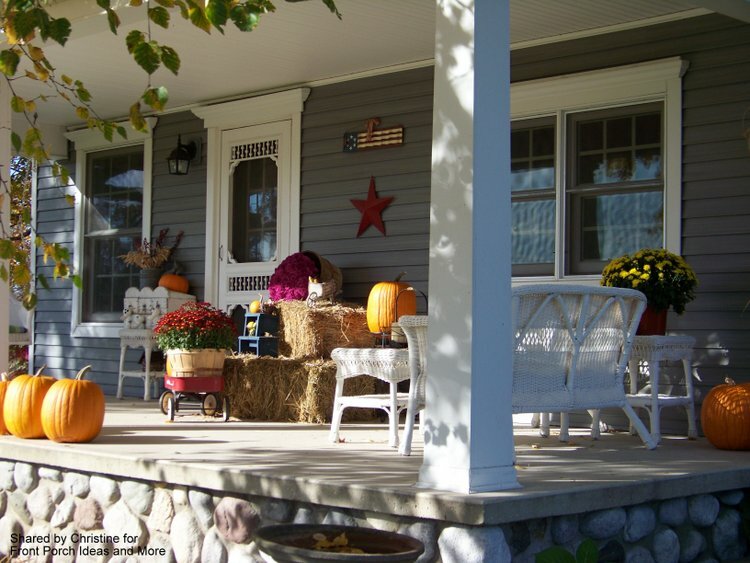 Hay bales, bright and colorful mums, personable scarecrows and an American flag....beautiful way to greet your guests on Thanksgiving Day. 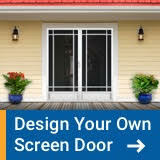 This is a neat idea and works well even in locations that don't experience the full colors of fall. 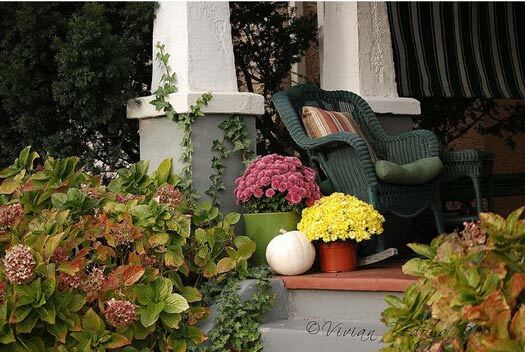 Replicate those colors using autumn garland to give your porch a warm autumn feel. 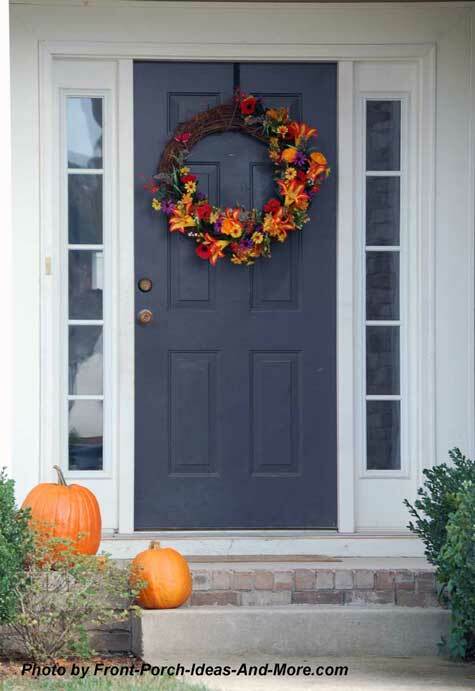 Pick up those same colors in a stunning front door wreath. 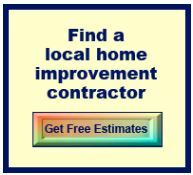 Simple works. 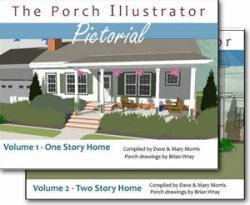 It doesn't take a lot of decorations to add some charm to a porch. Scarecrows work throughout the autumn season. 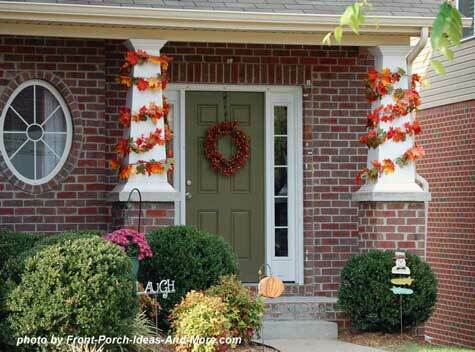 Autumn wreaths add lots of charm and punch to any porch. 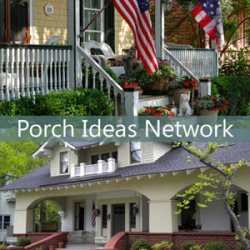 Wreaths are easy to make or you can purchase one to match your outdoor decor. In some places where we've lived, we've been able to keep our Halloween pumpkins and use them as outdoor Thanksgiving decorations. 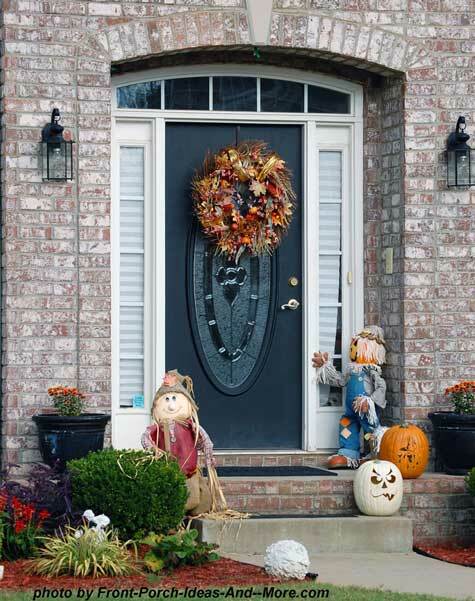 This bright autumn wreath looks really great against the dark blue front door - and the pumpkins pull it all together. 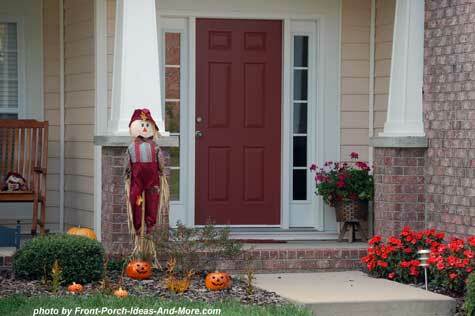 Like these Thanksgiving decoration ideas from Christine's porch? Fill a small child's wagon with mums and pumpkins.